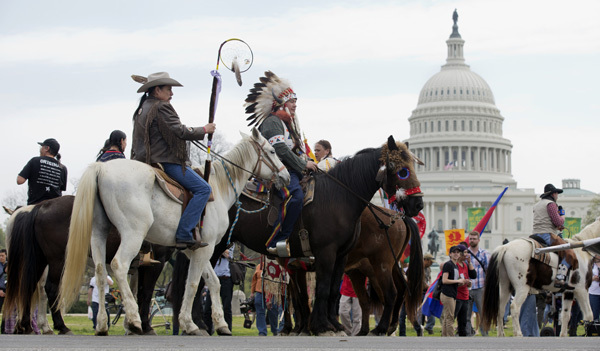 On Earth Day, April 22, a group that included Native people, ranchers and farmers called the Cowboy Indian Alliance, came to Washington, DC to mount a protest to stop the Keystone XL Pipeline. On Saturday, April 26, thousands of people including actress Daryl Hannah and musician Neil Young joined with the encampment in a mass protest. Keystone XL would increase by 830,000 barrels a day the flow of tar sands oil from Alberta, Canada, where it is extracted, to Steele City, Nebraska. From there, it would be piped to the U.S. Gulf Coast for refinement. Native people from Alberta, Canada spoke to how tar-sands extraction has already resulted in environmental catastrophe--causing an increase in cancer among the First Nations people, and a destruction of lands and water in Alberta. One rancher who participated, Tom Genung, described the evolution of his thinking. "When I found out about the Keystone XL pipeline, I was like Not in My Backyard--take it someplace else. Then the BP oil spill happened, around that same time. And at the TransCanada pipeline meetings I heard exactly the same rhetoric about the spill. It was just hokey pokey stuff. They were saying anything that seems like an answer. Then I had the privilege of learning about some things like climate change, and here I am sounding just like an environmentalist."